Background will remain maroon. You are just choosing the color of the text (writing) with this option. 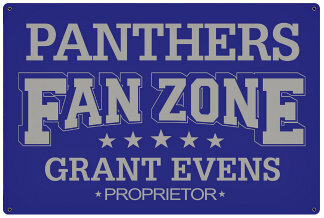 Proudly display your team pride. 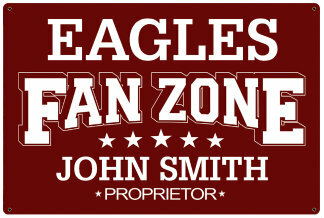 This Personalized Fan Zone Metal Sign - Maroon is ideal for the office, garage, man cave, home bar, game room, kids room, established bar or other room. 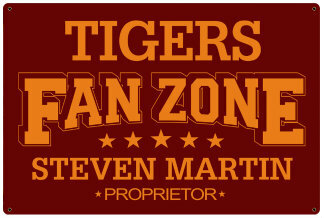 Personalize with a team name or city, proprietor's name and then choose from gray, orange, white or yellow colored text (writing) with a maroon background. 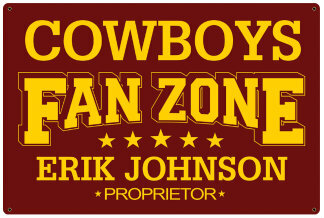 Durable and attractive, this Personalized Fan Zone Sign is 18 in. x 12 in. and has a long lasting finish. It is drilled and riveted for easy hanging. Proudly hand made in the USA, is just under 2lbs and made of heavy 20-gauge American steel. Therefore, this is NOT a flimsy tin sign or cheap thin wood sign. A Man Cave Gifts Exclusive!